The secret for a perfect veal-cartilages salad lies in the onions, which have to be raw but also marinated in vinegar at least eight hours. Begin then, maybe the night before, to slice the onions very thin. Then place them in a container that contains just, without crushing them too much, cover them with vinegar, close it and store in a cool place, eg the compartment for the refrigerator vegetables. In this way, the onions will have lost much of biting flavor and will be delicate. 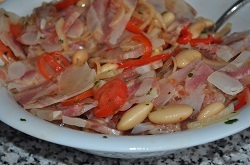 The next day, however, leaving squeeze vinegar wet for not having to then add to the salad in a bowl and season with white beans of Spain (boiled canned ones are fine), olive oil and parsley in good quantity. If desired, add peppers, tomatoes or both; more color damage, among other things. Add salt and pepper according to taste ... and there you have a nice salad of beans and onions! Now slice as thin as possible a veal-cartilages tile, add them to the bowl and mix together. Let stand no more than half an hour to cool, put on the table mixing it one last time. As we see from the recipe, I preferred not to indicate the quantities of oil and parsley: everyone adjust to taste. The nerves can be replaced with the head: north of the Alps is often found at this butchery, and the block is sliced ​​at the time directly from the butcher. As suggested above this is also the best way to prepare a nice salad of beans and onions; and in any case to have excellent raw onions to be joined to other salads. If desired, as seen in the photos, you can add strips of grilled and peeled peppers.